Two-storey, comfortable cottage with a large bedroom (double bed and 2 children's beds, wardrobe), a middle bedroom (small double bed and single bed, small wardrobe) and a single room with a bed upstairs. You will receive the bedding from us according to the number of persons booked and choose where you would like to sleep. On the upper floor is one of the two toilets. In the lower floor is the merging dining and living room, a small kitchen and the bathroom. The bathroom has a tub with a glass shower enclosure. From the kitchen there is a spacious veranda and the large garden. Of course you have the house to yourself. Except for the kitchen, each room has an adjustable radiator. All rooms can be darkened with shutters. In the garden is a small sandpit. Indoor children's toys are located on the upper floor in the closet, which is for the garden in the basement. It is important to our family that living space is not empty, not forfeited, but used at a reasonable price. Therefore, our nice neighbor uses our yard to turn off his tractor and a trailer. He stores his tools for his forest in the garage. Our neighbor is also your contact person if you need help. There is still room in the yard for your car if you do not want to park in front of the house. The fruit in the garden should be eaten. As our guest you can eat to your heart's content apples or cherries and use the herb bed. In the basement you will find a washing machine and a condenser tumble dryer. In summer, the drying rack - set up on the veranda or in the garden - dries your laundry much faster. Cleaning supplies, brooms, buckets, the vacuum cleaner, etc. can be found in the basement corridor. We modernize our house carefully and beautify and modernize continually. How to find old and new furniture. The large bedroom has kept its old beds, of course with new slatted frame and new mattresses. Beds and closet we have painted bright. All other rooms have new beds. Our kitchen is very small. It has a sink, a small dishwasher for 9 place settings, a double-burner gas stove (with gas cylinder operated), an external small oven with grill function, a refrigerator with freezer, and a microwave. In the cupboards above the stove you will find a set of pots, pans and other cooking utensils. Above the sink you will find the dishes. The cutlery is in the cutlery box in the dining room. The red chairs in the dining room are washable, on the table is an oilcloth blanket. The adjoining living room with sofa, armchairs, table and TV invites you to movie nights, game evenings, reading evenings or leisurely discussions. You will find DVDs with series and feature films in the closet. Even books are no shortage. In the closet in the upper hall stores the children's toys for indoors. These are cars, playmobil toys, we pirate island and castle and other trifles. You are welcome to use everything. Please clear the toy carefully, because our grandchildren will look for their favorite toy immediately upon arrival. The garden furniture can be found in the basement, if they are not yet on the porch. The gray chest has cushions and blankets. 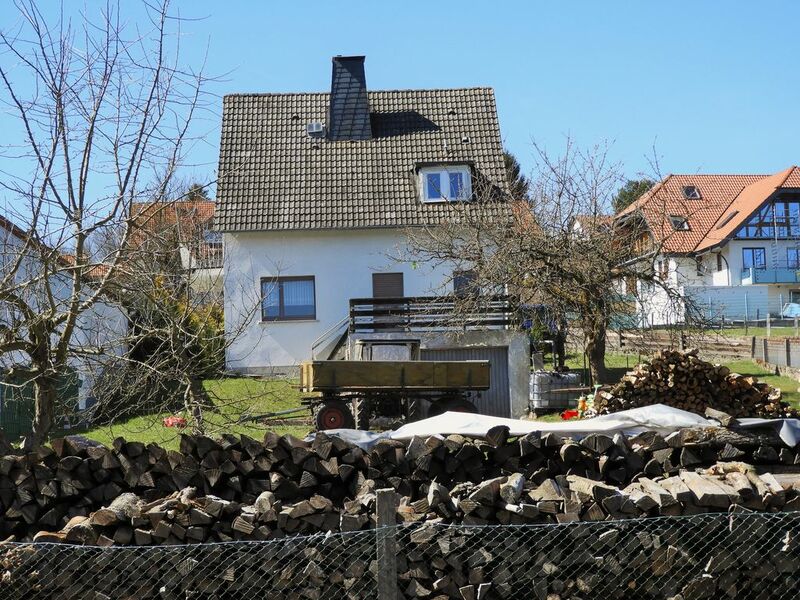 The house is located on the outskirts of Heubach, 500 meters from an inn. Heubach has been a recognized resort since 1998. The village is located in eastern Hesse at altitudes 419-509 m above sea level. NHN. Heubach is located on the northern edge of the Hessian Ridge, the connecting ridge between Rhön and Vogelsberg. The district Heubach belongs to the landscape protection area Frauenstein and lies in the nature park Hessian Rhön. Within a radius of 25 km is the baroque and university town of Fulda, the spa town of Gersfeld, with a deer park, the Wasserkuppe, and Bad Brückenau. The house is located on the outskirts of Heubach in the crooked Rhön. If you go out the front door, you are immediately on hiking and walking trails past fields, pastures and forests. You can walk with moderate altitude differences or take the challenge of low mountain ranges. An inn with an out-of-home sale, beer garden and own butchery is also less than 500 meters from the house. Within a radius of 25 km is the baroque town of Fulda, the spa town of Gersfeld, the spa town of Bad Brückenau and Steinau with a large adventure park. Special attractions for children are the Wildpark Gersfeld and the Erlebnispark Steinau. In moths at the volcano ruin there is a mineral water spring. Here children can fill their own mineral water and observe how gas pearls form and the iron settles after some time. You do not have to worry about your physical well-being. The Gasthof Rhönsicht and the Cafe Cefalo are in the village and can be reached in 5 minutes. The Deutsches Fahrradmuseum in Brückenau offers home-baked cakes and an evening menu, while the Gaststätte am Volkersberg is known for cakes and homemade bread. The Gasthof zum Bieber in Speicherz sells exquisite rose hip wine. In Gersfeld you should definitely eat ice cream in the ice cream shop Venetia am Marktplatz.